BARACK OBAMA’S health reform was supposed to bring universal health coverage to America on January 1st, 2014. It won’t. To understand why, consider states such as Mississippi. Terry Brown, a Republican state senator there, stood before his colleagues on June 28th, as they lounged in summer poplin and seersucker. They had assembled to decide whether Mississippi would expand Medicaid, the public health program for the poor, as Obamacare urges. That day Mississippi said it would not. “I don’t want Mississippi to be a part of that train wreck,” said Mr Brown. Obamacare aims to extend insurance to the poor in two main ways, both starting in 2014. First, it required states to offer Medicaid to all those with incomes of up to 138% of the federal poverty level, or $15,856 for an individual. (At present Medicaid must cover only some poor people, such as pregnant women.) The federal government and the states usually share the cost of Medicaid. But Obamacare would pay for the expansion through 2016, with the feds’ share falling to 90% in 2020. Second, individuals would be able to shop for insurance on new state-based markets, called health exchanges. Those with incomes between 100% and 400% of the federal poverty level would qualify for federal subsidies. Neither provision is going as planned. Last year the Supreme Court made the Medicaid expansion optional. At least 21 states say they will opt out. Even more are refusing to set up their own exchanges, leaving the task to federal bureaucrats. Mississippi would seem the ideal place to cover more poor people. It is America’s poorest state and has the shortest life expectancy. 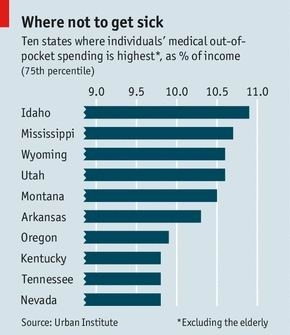 Its current Medicaid programme is among America’s least generous. Mississippians devote an unusually large share of their income to health care (see chart). One resident in five is uninsured. But Obamacare’s main provisions have gone nowhere in the Magnolia State. The fight over the Medicaid expansion involved hair-raising brinkmanship. Had lawmakers not voted before July 1st, the state’s entire Medicaid programme would have stopped functioning. Republicans insisted an expansion was unaffordable. State Medicaid costs would have increased by 7% from 2013 to 2022, estimates the Urban Institute, a think-tank. That is much less than the expected 30% increase in Medicaid subsidies from the central government. But the 7% rise would have been bigger than in any other state, mostly because Mississippi’s current Medicaid programme is so skimpy. The fight over the state’s exchanges was equally bareknuckle. Mississippi’s elected insurance commissioner wanted a state-based exchange. The Republican governor, Phil Bryant, wanted nothing to do with Obamacare. After a messy spat, plans for a state exchange dissolved. By default, Mississippi will have a “federally facilitated exchange”, managed by the health secretary’s deputies. So far only two insurers have made bids to sell health plans on it. Residents of 42 counties will have a choice of only one subsidised plan; 36 counties will have none. And many poor Mississippians will be ineligible for Medicaid. Stansel Harvey is the boss of the Delta Regional Medical Centre, in the heart of old cotton country. The Mississippi Delta contains some of America’s poorest counties. About 10% of Mr Harvey’s patients fail to pay their bills. The insurance expansion would have made many of them paying customers. Crucially, that new revenue would have helped offset another Obamacare change: lower payment rates to hospitals. Without new insurance revenue, Mr Harvey reckons that he may need to cut services. If other hospitals follow suit, Mississippians will have a problem. In the age of Obamacare, they may have less access to health care, not more.